There’s a time and a place for hertz and gigahertz, says Mr. Loadlink. I read an article recently about public speaking in which the author wrote about the importance of being passionate about their subject matter. They argued that only if a presenter is bordering on rhapsodic would they be able to engage their audience. The piece went on to explore how a speaker who isn’t wholehearted about their content will always be nervous, reliant on notes and unable to command respect. Whilst I agreed with many of the points raised, I was always reading ahead to find a reference to the importance of assessing the audience and tailoring content accordingly. In this instance, that key notion was missing. Language is the simplest way of tailoring information for an audience. I say it doesn’t actually matter how passionate a speaker is or how eloquently they make their case, if the information isn’t relevant to those on the receiving end it’ll fall on deaf ears. This blog isn’t about presentations per se but more generally covers the process of one entity passing information to another. Given my audience (readers of this blog) are largely from the industrial market, I’m going to focus on effectively communicating the business of a product supplier to a potential customer or supply chain partner. I’ll also suggest it’s important to remain flexible as it isn’t always clear exactly who the recipients of the pitch will be. Take your company’s most popular product and consider how it can be packaged or communicated differently to various audiences. In Straightpoint’s case, it is the Radiolink plus load cell. To some people, it’s important that units are supplied with an update rate of 3Hz and can be easily configured to run at speeds of up to 200Hz. The same folks might be interested to know that data is transmitted wirelessly utilising the latest in IEEE 802.15.4 (2.4 GHz) technology. However, to others, it’s only important that a Radiolink plus measures a load, relays the data to a reader and facilitates completion of a load test accordingly. There are those, meanwhile, to whom the application of the product means even less; they’re concerned only with the monetisation of force measurement technologies. You see why a standard presentation or pitch would nearly always misfire as so much of it would be redundant every time. And this is our best product! Use other equipment to apply the point to your own industry sector. Think of the supply chain for, say, a mobile crane. 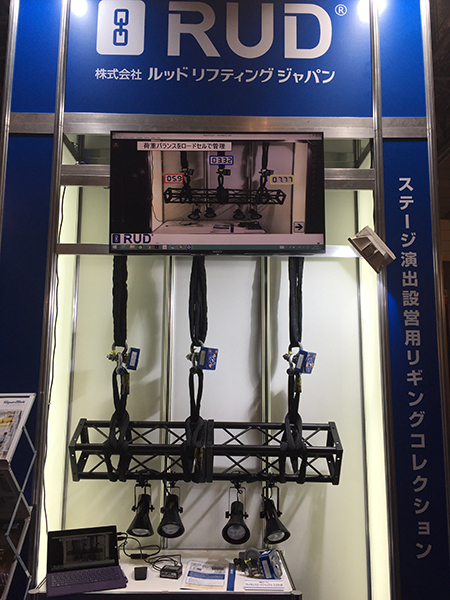 A manufacturer, rental company, contractor, operator and rigger are all going to interact with the machine, yet all care about different characteristics. Further, to effectively communicate the crane’s potential to some, it will need to be put into the context of marketplace, market share, utilisation, and industry trends. Actually, how the crane fits a business plan might be more important than how it lifts a load. It means one better get to know the audience before they pack the suitcase and slip the USB stick into their top pocket. If it’s a meeting at a factory or company offices, find out who will be involved and what their role is at the company. If the CEO and CFO at a potential new distributor of Straightpoint equipment have agreed to meet a representative, they’re going to want to know how much units cost; what margins they can expect on their use; who is currently supplying them (or not) in the market; what the potential is based on research; etc. These guys are unlikely to be engineers and won’t want to, frankly, be bored by technical detail. Conversely, if a company welcomes a sales pitch and says the head of engineering and the maintenance boss will be hosting the visit, a different approach will be required. It might be worth following references to 200Hz and IEEE 802.15.4 (2.4 GHz) technology with a few nuggets about LED wireless scoreboards and base stations with analogue (4-20mA, 0-10v, 0-5v) or digital (RS232/485, Modbus RTU, and ASCII serial communications protocol) outputs. If they continue to salivate, tell them about IP67 waterproof rating, 1,200 hours battery life, 700m / 2,300 ft. range, and no external antennae. Give that part of the presentation to the CFO and he’ll switch off, open his laptop and start working on his latest P&L spreadsheet. Trouble is, the presenter won’t be in it! A meeting with another party is a valuable opportunity and not one to take lightly. If someone has taken time to put an appointment with a supplier in their diary, they’ve acknowledged that what they have to offer is of potential interest—so use every second. Of course, it isn’t always possible to cover everything, particularly if only a short timeframe has been given and / or there has been a late change in personnel or schedule. In these cases, it’s good practice to invite follow-up questions and supply additional information once you’re back in the office. Or, ‘It’s true that we want to add you to our distributor network but another company has exclusivity on these markets so you’ll have to sell only into a territory 150 miles away that has no telephones’. Practice with your content; imagine someone who you’d like, or are likely, to meet, think about what they do and how it relates to the solution you offer. Then, based on everything you know, take the bits that mean the most to that person. If you get the chance and really want to impress them, tailor an introductory slide or message that is exclusive to them. Consider how much more engaged they’d be than if confronted with a two-year-old date and a one-size-fits-all PowerPoint presentation where Page 2 shows a photo of a building boasting its square footage. We’re on the cusp of another general election in the UK, where you’d expect political party leaders to always consider their audience of the day. It doesn’t always work like that, however. Regardless, it set the scene for a number of recent business trips where the objective was to continue to spread the key messages of the SP manifesto and build knowledge on our product offering. 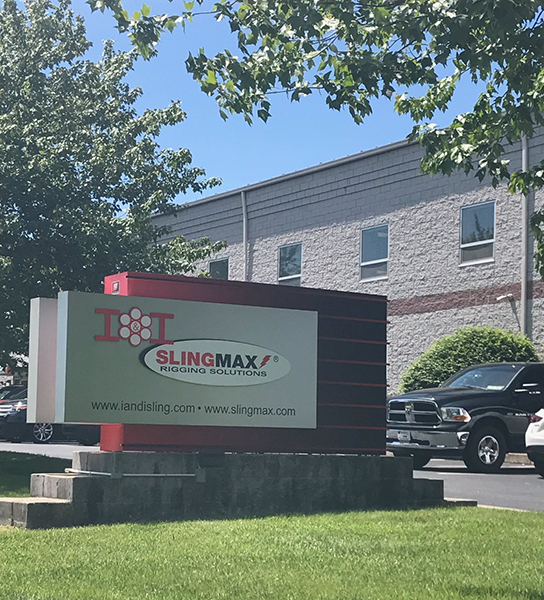 I&I’s Slingmax is a global brand, proudly displayed outside its offices. 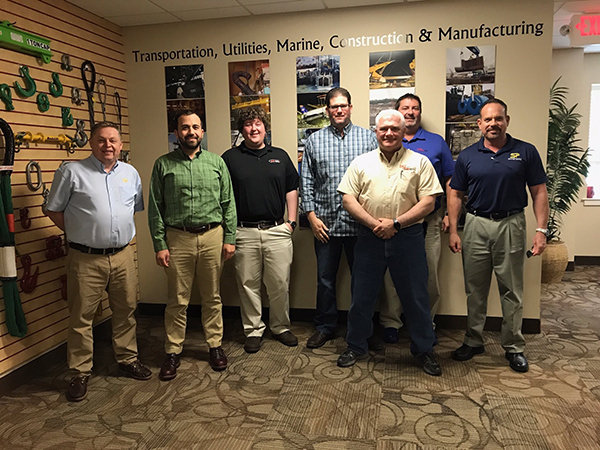 Here I am (left) with John Molidor (right) and the team at I&I Sling Inc., commonly associated with its Slingmax Rigging Solutions brand. There was plenty of time to discuss these matters with John Molidor, director of sales for the western hemisphere, on the campaign trail when we went to Baltimore, Philadelphia, New York and Boston to visit stateside dealers. Before each meeting, we reminded ourselves of all the important details covered above—who are we meeting? What are their roles? What does their company do? What products might they be interested in? Etc. Where appropriate, we took the opportunity to discuss and plan joint strategy to increase sales and gain U.S. market share. Policy detail was further tailored more recently ahead of a trip to Singapore (where I am writing this blog) and later Malaysia to conduct training workshops for sales and engineering teams at local distributors. It should be clear by now how I plan to greet a single sales representative versus a room full of engineers.